The SAP had another chai-spluttering moment when he read that headline. Yet it is his fault, given he alerted me to a problem that appears to be invading church youth across Australia, possibly even the world. No-one seems to be getting any. And by ‘any’ I mean courting. Courting is apparently dead in the church. Caught between friendship with fellow female young Christians and wrestling with what’s written about scriptural purity, it appears there are scores of young Christian men frozen by indecision. This is not good! It’s hard enough getting people along to church in this reaching, secular world. If all our young Christians end up so frozen by purity that they can’t even ask each other out for a coffee/cake/gentle get to know you, what chance have they got of ever getting together, tying the knot, and bringing lots of young baby Christians into the world? 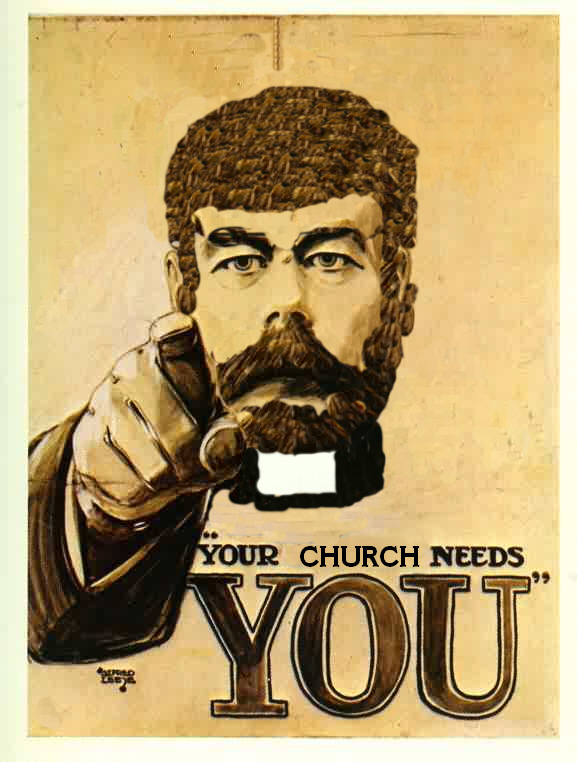 I am reminded of the World War Posters – Christianity Needs You! As readers will know, I’ve been longer secular than Christian. You really don’t want to know the full story of how my husband and I met. Suffice to say it had something to do with me getting my name on a plaque on a pub in Bathurst that required me to drink 100 pints of Guinness. Big T was brave enough to stand out from the easy-on-the-eye, yet conversationally challenged local stock and station agent with whom I had been attempting a dialogue. Big T plonked a diet coke down in front of me and the rest is history. I did still get my name on the plaque, though. I attempted to quickly converse with the conversationally-challenged local stock and station agent because I was freaking out! I was an enlightened, double-degree holding, career-minded woman whose predecessors had won her the vote. What was all this sappy, our eyes didn’t even meet across a crowded room and I was getting the shivers, business? But God found a way. May have taken a while for me to cotton on (sorry God) but He found a way. Based on the above, the lesson is that God really doesn’t need any help in bringing a spouse into your life. So get over worrying about that bit. Yes, marriage is serious. But coffee does not equal marriage. It does not mean, “and with this latte/double shot/soy/skim cappucinno, I thee wed.” But you do need to at least make the effort to try out a few beans (am I using a really bad metaphor here, given everyone may now turn their minds to grinding?) to see if you blend! You’ve got Christianity in common. Which I why I used the headline. Do you know how hard it is in the secular world to meet someone, fall in love, stumble through the ‘rules of dating’ (Lord, save me from the rules of should I call him after 3 days or will I look too desperate? ), get married, have kids and then stay together when the reality sets in that the chemistry they unleashed during dating simply isn’t enough? There is such a thing as peaking too early. Fewer people today think of marriage as a Christian institution. Oddly, it has become something to tick off the to do list. “I must get married before I’m 30..35..40..etc.” say many women. So, guys, listen to me when I write this: Christian girls ARE easy, because, if you are Christian too, you will already understand what’s in her heart. Jesus is in her heart, right? So start with that. There is so much I could blog on about: purity pledges being one. And I will. But, in the famous words of Napoleon: not tonight, Josephine. I have a headache.